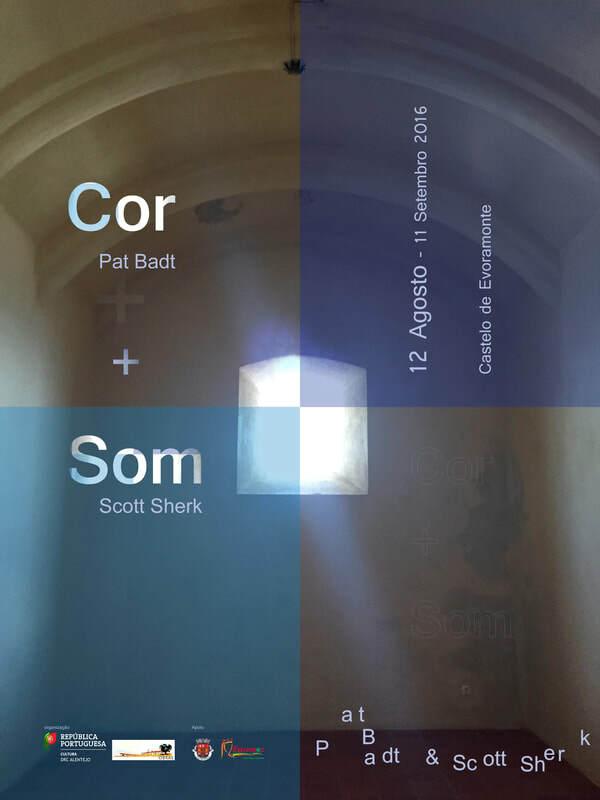 Cor + Som is the name of an installation by Pat Badt (lightcape) and Scott Sherk (soundscape) in the Castelo de Evoramonte. It had its inauguration on 21 August 2016 and closed on 25 September. Pat Badt and Scott Sherk (USA) are interested in the small, everyday textures of life—the reflection of light off a roof, the sound of the crickets by the window, the rush and movement of the wind through the grass... Cor + Som is an attempt to make art from these everyday elements. During their residency in 2015 they collected notes and studies concerning sound and color. Scott Sherk made audio field recordings of the surrounding area including Evoramonte Castle, sheep pastures, windy fields, Saturday markets, and the rhythms of the day. Pat Badt noticed the colors and light of the landscape, the towns, the quarries, and the fields throughout the days. Together their perceptions of place build an experience of Cor + Som (Color + Sound). It occupies the 1st floor of Evoramonte Castle. The main chamber presents sound compositions created from the field recordings of Alentejo and a composition of light and color filtering through the windows of the castle. In the small antechamber, the brilliant light of the Alentejo sun is emphasized along with the original, unaltered field recordings of the surrounding area. Michel Alves made an artistic impression of the opening with specific attention to the sound. Once the exhibition was opened Scott Sherk worked on new soundscapes. He manipulated the sound of the wind passing barbered wire and he recorded the night sounds in prehistoric grave. Pat Badt explored the possibilities of using “Alentejo azul”, the blue pigment that is added to the plinths of housed when whitewashing the walls. In April, May 2017 Scott presented his Portugese work at Lehigh University (Bethlehem, Pennsylvania USA) A CD with the sound compositions by Scott will soon be launched. Pats work was exhibited in May 2017 at Lebanon Valley College (Annvile, Pennsylvania USA). In June 2017 Scott Sherk (USA) released a beautiful and intriguing CD with sound compositions of the wind, sheep bells, crickets and the interior sounds of Evoramonte Castle. More info is on www.3leaves-label.com. A beautiful review is on A Closer Listen.